(Nanowerk News) Creating a lithium-ion battery that can charge in a matter of minutes but still operate at a high capacity is possible, according to research from Rensselaer Polytechnic Institute just published in Nature Communications ("Vanadium disulfide flakes with nanolayered titanium disulfide coating as cathode materials in lithium-ion batteries"). This development has the potential to improve battery performance for consumer electronics, solar grid storage, and electric vehicles. The team, which also included Vincent Meunier, head of the Department of Physics, Applied Physics, and Astronomy, and others, determined that lithium insertion caused an asymmetry in the spacing between vanadium atoms, known as Peierls distortion, which was responsible for the breakup of the VS2 flakes. 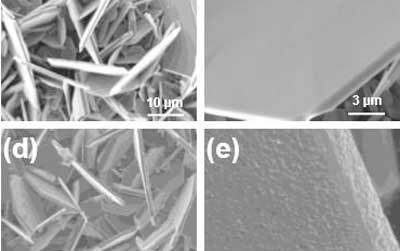 They discovered that covering the flakes with a nanolayered coating of titanium disulfide (TiS2) – a material that does not Peierls distort--would stabilize the VS2 flakes and improve their performance within the battery.